When a Russian spaceship returned three space men home today (Sept. 16), the recovery team sent to meet them caught a stunning sight: a Soyuz space capsule floating to Earth under a parachute with a bright moon in background. 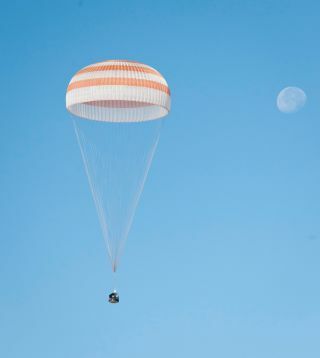 Ingalls' photo of the Soyuz under its parachute reveals a stunning view of the not-quite-full moon in the background. The moon reached its full phase on Sept. 12 in what astronomers call a Harvest Moon. Another photo by Ingalls captures the Soyuz at the moment of landing, when the space capsule kicked up a plume of dust just after firing landing rockets to cushion the final touchdown. The photographer snapped the view from one of the recovery helicopters before landing, then took more photos from the ground of the Soyuz crew back on Earth. The Soyuz TMA-21 spacecraft landed with NASA astronaut Ron Garan and cosmonauts Andrey Borisenko and Alexander Samokutyaev onboard, ending a 164-day trip to the International Space Station. The three men launched into space on April 4 and were aboard the space station during NASA's final two space shuttle missions in history, as well as the 50th anniversary of human spaceflight and the 30th anniversary of the U.S. space shuttle fleet. While the Soyuz landed right on target and on time, Russia's Mission Control team in Moscow did lose radio contact with the spacecraft during the descent, causing what appeared to be some tense moments. But contact was soon reestablished via a fixed-wing aircraft flying over the landing site, NASA officials said. A Soyuz landing video released by NASA chronicles the smooth touchdown of the TMA-21 space capsule. One final photo by Ingalls reveals a triumphant moment for the Soyuz TMA-21 crew. In the image, the three men are seated — still clad in bulky Russian Sokol spacesuits —in reclining chairs to help cope with the return to Earth's gravity after months living in weightlessness. Garan, Borisenko and Samokutyaev formed part of the space station's Expedition 27 and Expedition 28 crews. They left three other spaceflyers (now the Expedition 29 crew) behind on the space station. Russia plans to launch three more astronauts to the space station on Nov. 14 to boost the outpost back to a full six-person crew. During his mission, Garan shared his spaceflight experience via regular updates and photos to the Internet using the social networking site Twitter (where he wrote as @Astro_Ron) and on his website FragileOasis.org, which is dedicated to increasing awareness of the Earth and its environment. Garan is expected to return home to Houston by next week and will take questions from reporters on Thursday, Sept. 22, NASA says. "I will miss a thousand other things that define life in space and I understand and appreciate that I have been given a special privilege to have these experiences," Garan wrote. "Because of this, I also feel a great responsibility to share these experiences, as best I can, with as many people as possible. I have tried very hard over these past months to do just that." "I have found that sharing this experience with all of you has made the experience more meaningful and enjoyable," Garan added. "I thank you all for being with me on this journey."